The typical amount of time a person spends in the bathtub in a day isn’t much, but it’s enough to make us miss our phones and laptops for a while. 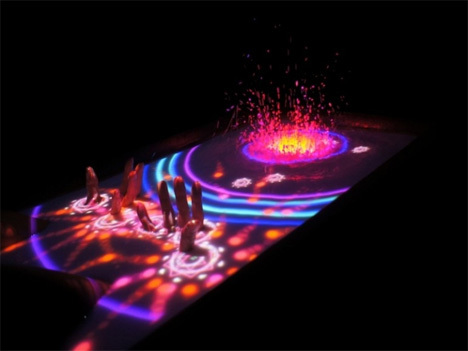 Thankfully, we have to suffer no more: the Aquatop is a system that involves a Kinect camera and a projector mounted above the tub; a pair of waterproof speakers and a PC round out the setup to create an immersive touchscreen out of the surface of your bath water. Bath salts have to be added to the tub to make the surface milky enough to project images onto. Aquatop lets you play video games when you’re in the tub – something that would be ill-advised at best with traditional gaming systems. The waterproof speakers provide haptic feedback as you play, creating effects like water spouts. Your fingers act as the controllers when you touch the surface of the water, hold them above the water or poke them through the surface from under the water. 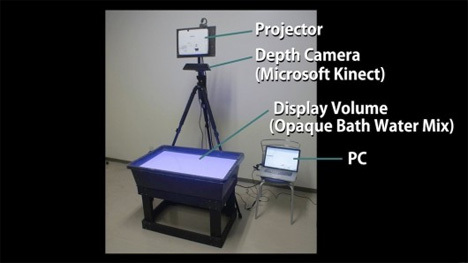 The PC attached to the system also allows you to use the surface of your bath water as a desktop computer. You can scoop up a piece of media that is projected on the water and drop it onto a media player, which will start the media playing. 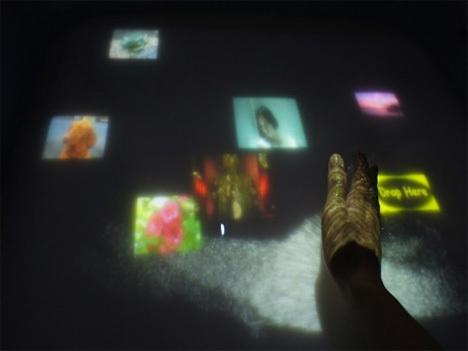 Projected images can be removed from the “screen” by making waves in the water that wash them away, or by simply reaching three fingers up from beneath the water and “pulling” the images under. Letting your limbs float to the top of the water allows you to become a part of the display, melding human and technology in a novel way. Though we doubt we’ll ever see a setup like this on the commercial market, it is a brilliant example of what can be done with unconventional interfaces. See more in Computers or under Gadgets. August, 2013.